The term Buddha means “Awakened”. As he fully comprehended the Four Noble Truths and as he arose from the slumbers of ignorance he is called a Buddha. Since he not only comprehends but also expounds the doctrine and enlightens others, He is called a Samma-Sambuddha — a Fully Enlightened One. 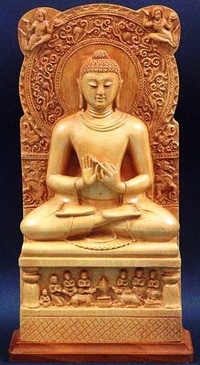 Before His Enlightenment he was a bodhisattva which means one who is aspiring to attain Buddhahood. He was not born a Buddha, but became a Buddha by his own efforts. Every aspirant to Buddhahood passes through the bodhisattva period — a period comprising many lives over a vast period of time. During this period he undergoes intensive spiritual exercises and develops to perfection the qualities of generosity, discipline, renunciation, wisdom, energy, endurance, truthfulness, determination, benevolence and perfect equanimity. In a particular era there arises only one Fully Enlightened Buddha. Just as certain plants and trees can bear only one flower, even so one world-system can bear only one Fully Enlightened Buddha. The Buddha was a unique being. Such a being arises but rarely in this world, and is born out of compassion for the world, for the good, benefit, and happiness of gods and men. The Buddha is called by many epithets, among them The Great Physician, The Giver of Deathlessness, The Lord of the Dhamma (Doctrine). As the Buddha himself says, “He is the Accomplished One, the Worthy One, the Fully Enlightened One.” The Buddha had no teacher for His Enlightenment. His knowledge of the secrets of all existence was realized by himself through his own intuitive wisdom. One may think that the Buddha was a human. But the Buddha denied this too. Once a Brahmin named Dona, approached the Buddha and questioned him. “No, indeed, brahmin, a deity am I not,” replied the Buddha. 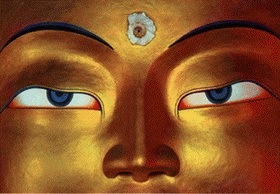 The Buddha had discovered the path to liberation from the cycles of continued rebirth in this world. Out of compassion for the world, he shows the path and method whereby he delivered himself from suffering and death and achieved man’s ultimate goal. It is left for man to follow the path. These significant words uttered by the Buddha in his last days are very striking and inspiring. They reveal how vital is self-exertion to accomplish one’s ends, and how superficial and futile it is to seek redemption through self-proclaimed saviours, and to crave for illusory happiness in an afterlife through the propitiation of imaginary gods by fruitless prayers and meaningless sacrifices. The Buddha was a human being. As a man he was born, as a Buddha he lived, and as a Buddha his life came to an end. Though human, he became an extraordinary man owing to his unique characteristics. The Buddha laid stress on this important point, and left no room for any one to fall into the error of thinking that he was an immortal being. This is important as he sets an example for what we too can achieve if we are to put effort in practising his teachings. Born a man, living as a mortal, by his own exertion he attained the supreme state of perfection called Buddhahood, and without keeping his Enlightenment to himself, he proclaimed to the world the latent possibilities and the invincible power of the human mind. Instead of placing an unseen Almighty God over man, and giving man a subservient position in relation to such a conception of divine power, the Buddha demonstrated how man could attain the highest knowledge and Supreme Enlightenment by his own efforts. He thus raised the worth of man. He taught that man can gain his deliverance from the ills of life and realize the eternal bliss of Nirvana without depending on an external God or mediating priests. He taught the egocentric, power-seeking world the noble ideal of selfless service. He protested against the evils of caste-system that hampered the progress of mankind and advocated equal opportunities for all. He declared that the gates of deliverance were open to all, in every condition of life, high or low, saint or sinner, who would care to turn a new leaf and aspire to perfection. He raised the status of down-trodden women, and not only brought them to a realization of their importance to society but also founded the first religious order for women. He banned the sacrifice of unfortunate animals and brought them within his compass of loving kindness. He did not force his followers to be slaves either to his teachings or to himself, but through teaching the famous Kalama Sutta, granted complete freedom of thought and admonished his followers to accept his words only after subjecting them to a thorough examination. He comforted the bereaved who had lost loved ones. He ministered to the deserted sick with his hands. He helped the poor and the neglected. He ennobled the lives of criminals and courtesans and accepted them into his order of monks. The rich and the poor, the saint and the criminal, loved him alike. His noble example was a source of inspiration to all. He was the most compassionate and tolerant of teachers.